For a while, I wanted the Michael Kors Jet Set tote (below, left). It was all the rage a few years ago – such clean lines, elegant but practical. I don’t know if it always had a zip-top as it has now but I didn’t enjoy the way it pinched the top in profile view to have a zipper. 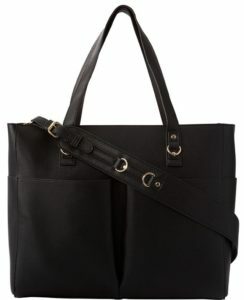 So, instead of spending over $200 on a Jet Set (what a captivating name), I bought the Emily tote from Indigo! in indigo (below, right). It has a large capacity – possibly larger than the large version of the Jet Set and an open top. It was easy to toss things in and the body was thick and sturdy. It doesn’t have a shiny gold-colour MK pendant but I accessorize with a cute leather keychain shaped as a green bear and a bling-y Wynn Las Vegas keychain. But what was really disappointing was that the Emily tote’s straps fell apart really quickly with glue separating from fabric and apparently I don’t have too much pride to continue using it despite light fibers hanging from the straps. I didn’t keep the receipt and really could have gone back and complained. A few years have passed and I put away the Emily for a stretch, used again when I went on an overnight road trip every now and then. As a change from bringing a green knapsack to work that doubles as E’s diaper bag on the weekends, I started using the Emily tote again but decided it’s time to retire on account of the gross straps. I wanted to replace the Emily tote with another elegant, work-appropriate bag and I was fed up with commuting with a knapsack and having to take it off on the train. 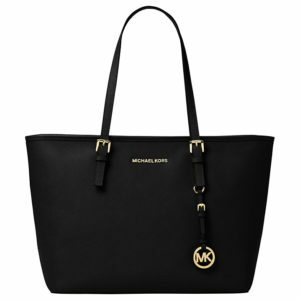 The Emily tote is so rigid and almost oversized it gave me more room on the subway – yay. I checked out Michael Kors again to confirm I didn’t want the Jet Set this time. I checked Zara because I have a gift card. For some reason, I didn’t want an H&M bag – feels like it would be too common. So, I was back at Chapters/Indigo! I don’t see the Emily tote in stores and today I don’t see it online either but I saw the following negative review and nodded vigorously in agreement. 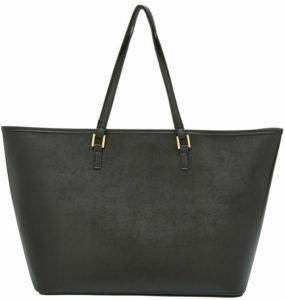 These days, the Dylan tote (below, left) seems to be the darling product at Indigo! and attempting to be a Jet Set dupe, but it is too small for my 15″ work laptop. 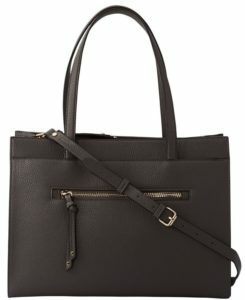 The Lola tote (below, right) is a similar tote-approaching-satchel style that I looked at next and I nearly bought it… until I noticed the Taylor totes. 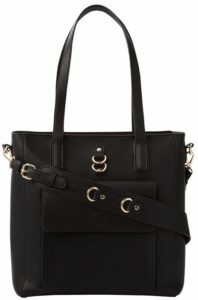 Then followed the rapid-fire conversation with myself to decide between the Lola and Taylor North South Tote. The Lola reminds me of the satchel style that is part of the Queen’s perennial style. As elegant as I want to be, it also strikes me as old, or making me appear older, more matronly. The Taylor seems more youthful while also being undeniably professional. It might even be trendy but WHAT DO I KNOW? Most importantly, what sealed the deal, is that with the Taylor, I am able to convert between wearing it on my shoulder and crossbody. The Emily did not allow me to do it. I got excited when I first looked up the Taylor tote because it was named the Taylor East West tote (below, left) before I realized the photo did not match the elongated tote I was considering. 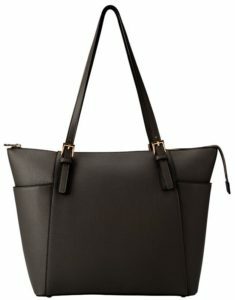 I was, in fact, considering and purchased the Taylor North South tote (below, right)*. Apparently “East West” as a name for models of handbags exists and as much as that term has meaning to me, I went with North South. Heehee – I like the comment how it looks more expensive than it is. And this time – just in case – I’m keeping the receipt! * Actually, there is a Taylor North/South tote by Coach. Using the same name? Not cool, Indigo!